For other uses, see Cline. In biology and ecology, an ecocline or simply cline (from Greek: κλίνω "to possess or exhibit gradient, to lean") describes an ecotone in which a series of biocommunities display a continuous gradient. The term was coined by the English evolutionary biologist Julian Huxley in 1938. More technically, clines consist of ecotypes or forms of species that exhibit gradual phenotypic and/or genetic differences over a geographical area, typically as a result of environmental heterogeneity. 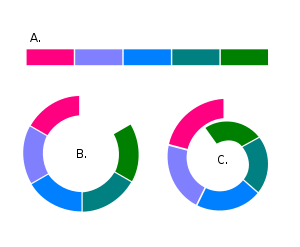 Genetically, clines result from the change of allele frequencies within the gene pool of the group of taxa in question. Clines may manifest in time and/or space. In ecology, spatial clines have led to gradient analysis where the abundance and distribution of organisms is rendered by sinusoidal curves on the plane. From these curves can be extracted that populations occupy zones of maximum and minimum presence, according to their special needs and tolerances imposed by their environment. Typically, a well-marked cline does not allow for a delineation of subspecies, as it is then impossible, by definition, to draw any further clear dividing lines between populations. In population genetics, a cline could include a spectrum of subspecies, as allele and haplotype frequencies tend to vary over a larger space; moreover, in evolution, genetic lineage sorting usually lags behind the establishment of locally differentiated phenotypes. Regardless, in neither case will such a variation yield different species, as long as the populations, though geographically spread, can interbreed one with another. The Larus gulls interbreed in a ring around the arctic. Ring species are a distinct type of cline where the geographical distribution in question is circular in shape, so that the two ends of the cline overlap with one another, giving two adjacent populations that rarely interbreed due to the cumulative effect of the many changes in phenotype along the cline. The populations elsewhere along the cline interbreed with their geographically adjacent populations as in a standard cline. Ring species present an interesting problem for those who seek to divide the living world into discrete species, as chain species are closely related to speciation (in this case, parapatric). In the case of Larus gulls, the habitats of the end populations even overlap, which introduces questions as to what constitutes a species: nowhere along the cline can a line be drawn between the populations, but they are unable to interbreed. However a recent study (Liebers et al., 2004) has provided genetic evidence that this example is far more complicated than presented here, and likely does not constitute a typical ring species. ↑ For definition and an etymology, see Merriam-Webster entry for "cline." ↑ Microsoft Encarta Premium 2009: "cline"
↑ King, Stansfield, Mulligan: A dictionary of genetics, 7th ed. (2006), Oxford University Press:"cline"